After just managing to hold on to win Game 2 despite a leaky bullpen, the Blue Jays look to grab a series win in today's matinee. 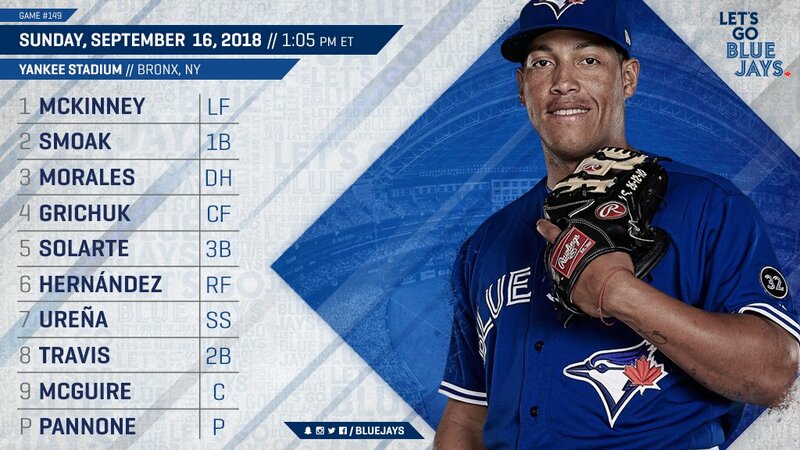 It'll be an accomplishment if the Jays can avoid getting beaten to a pulp into the ground as the Yankees look to get back on track to securing home field advantage for the wild card game. Thomas Pannone takes the ball on the mound today against Lance Lynn. Fun pitching matchup today, even if the latter is likely to only go 3 innings or so: Jacob deGrom vs. Chris Sale. deGrom hit exactly one HR while in college and guess who he hit it off?
. @JdeGrom19 hit one homer in college. It was off Chris Sale. Too bad they're in an AL park, so deGrom won't be wielding a bat. This is your "Let's make the Yankees sweat" game thread.